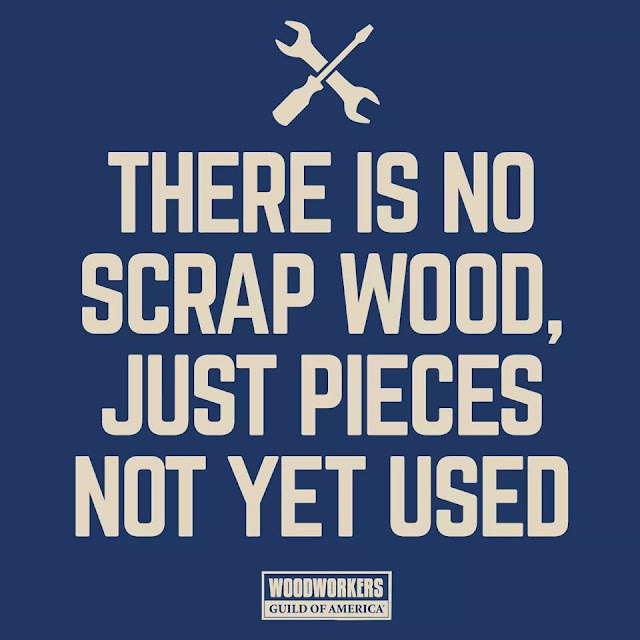 I have long said the only scrap wood is wood you throw away. After watching a video where they were cutting out knots from the wood to make jewelry I am not sure that is true. It always irritates me when I see someone in a video talking about how they made their project from​ scraps. Double this irritation when it's some expensive wood I can't buy in my area. I have a box of small pieces in my shop. My grandson, Odin, found them and immediately began to drag the box toward the door. "Where are you going?" I asked. "I take to living room." He said. So I gave him a hand getting the heavy box into the living room where he began to go through the box sawing things like "Look at this one!" Once he had them all in the floor he began building castles. Not scrap, blocks for building castles. Even at 3 Odin knows this. 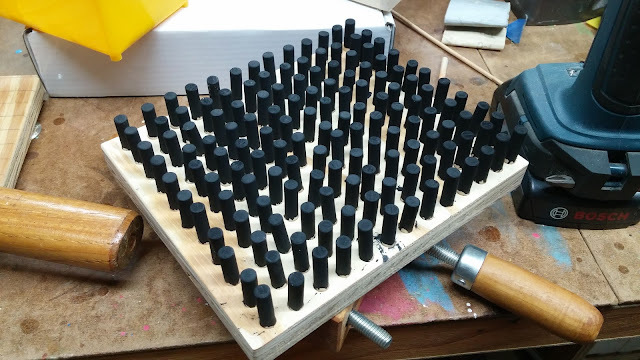 I needed to paint 200+ small dowels and needed some way to hold them. I ask the question in the toy makers forum and got a lot of good suggestions. The problem with these suggestions were that they only work well if your making one toy and only need to hold a few parts. I needed a much better solution that would work for lots of parts. I finally concluded that I needed something that worked perfectly for the parts I was making. It had to be cheap and easy to make. The part is exhaust pipes for my Hot Rod Freaky Fords. 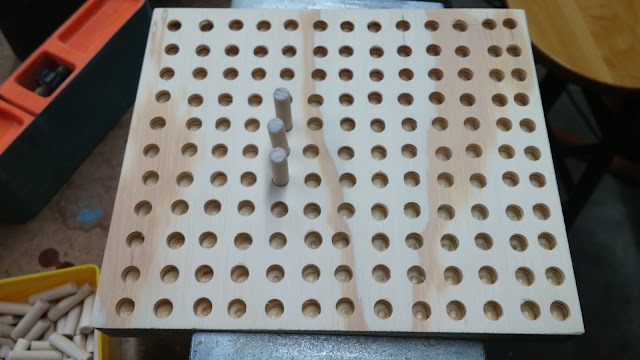 These are 1 inch long dowels that are glued into 1/4 inch deep holes. They need to be painted and leave enough pare wood for gluing. The first thing I came up with was this. I just grabbed a piece of plywood that I had already and went to work. After I started painting I soon discovered that not only was it not big enough but that you need at least twice as many holes as the number of parts. What are you going to do with these parts while you are adding the second coat of paint or clear coat. The holes are 1/4 inch deep on 1/2 inch centers. Drilled to my next larger bit size. If the holes are not bigger the parts will get stuck. In the mid 80s I was stationed at Tyndall AFB. My workshop was the patio on the back of our home. I would drag my Shopsmith out onto the patio, run a power cord out the window. My workbench was some rickety saw horses with a few 2x4s laid across them. For an assembly table I sometimes used the trampoline we had for the kids. Not the best work table but it was huge and if it rained I didn't need to put it away. As the crow flies we lived less than a mile from the Gulf of Mexico. Even during a drought there were convection storms coming in off the gulf. Rain was a constant threat so I tried not to get to much stuff outside. I usually got plenty of warning so I seldom got wet. The sun was another issue. Let a cast iron table sit for long in the Florida sun and touch it with your bare hand and you will be sorry. The Shopsmith aluminum tables didn't get that hot. I made a lot of little projects in this makeshift shop and a few large ones. The pull trains in the banner was one of the projects. My daughters each got one and the rest were given away as gifts. When I set up the Odin's Toy Factory Etsy store I needed a banner. It had to be wooden toy related and something that would fit well in the banner space. I drug out every photo I could find of toys I had hoping I would find something that would work. 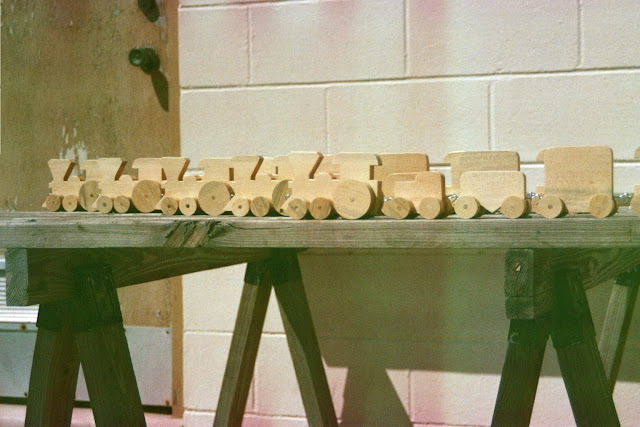 When I found the trains I knew that was it.